I’ve had the luck of working with lots of switch manufactures such as Cisco, Juniper, HPE, etc, etc, etc and this has been great because I’ve been able to learn how these switches work. I’ve also learnt proprietary protocols which afterwards have been release as IEEE standards. 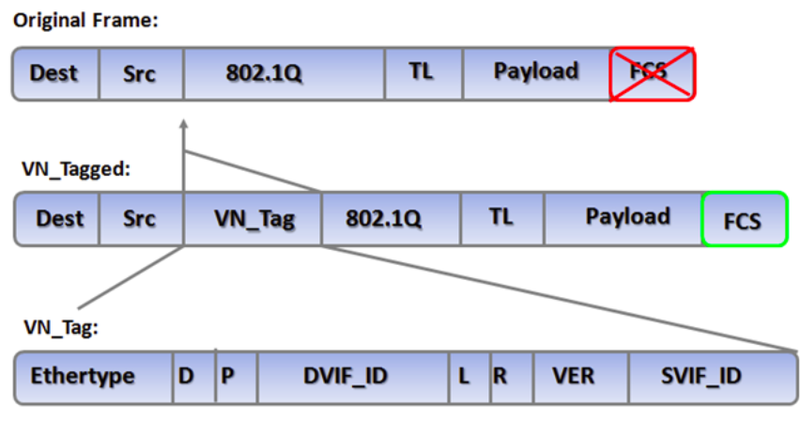 For instance, I want to write today about Cisco FEX technology along with the encapsulation mechanism VN-Tag, which are referenced in standards like 802.1BR (Bridge Port Extension), 802.1Qbg (Edge Virtual Bridging) and 802.1Qbc (Provider Bridging). Cisco FEX technology is easy to understand. We are familiar with modular switches where we have one or two supervisor modules for the management and control plane, and line cards for the data plane. FEX technology removes the line cards from the modular switch thus these I/O modules can be installed as ToR. In addition, these line cards, called Fabric Extenders, are no longer work in the data plane but they are Port Extenders which forward traffic to the Parent Switch where the management, control and data plane is carried out. This is a new architecture for most network engineers and, therefore, we’ll have to learn new protocols. 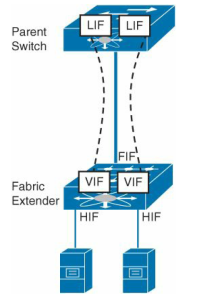 For instance, the VN-Tag protocol is an encapsulation mechanism to transport frames from the Port Extenders (FEX) to the Parent Switch, or Controlling Bridge according to IEEE. Thanks to this protocol, we can differentiate traffic between host interfaces traversing the fabric uplinks. 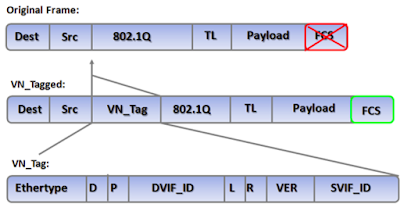 In addition, Cisco includes management and control protocols such as SDP (Satellite Discovery Protocol), which is used to discover FEX devices, SMP (Satellite Management Protocol), which is used to control FEX devices, and MTS (Message and Transmission Service), which is also deployed in Cisco Catalyst and it is used for inter-process communications. What’s really interesting in this architecture is the capability of FEX devices to forward frames to the Parent Switch without local switching, then, switching is performed by the Parent Switch. This is going to be like a virtual wire between host interfaces and the Parent Switch. 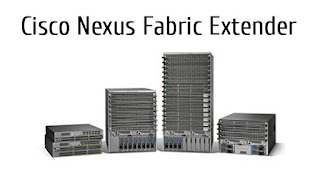 What’s more, this architecture has a great advantage for upgrading the Parent Switch performance because we’ll only have to upgrade the Parent Switch for better performance, due to the fact that forwarding and intelligent decisions are done by the Parent Switch, while FEX devices, already installed, can remain. Management is another advantage important to highlight because we can manage this topology from a single management device. Therefore, configuration and troubleshooting can be done from the Parent Switch while FEX devices are remote devices which are also configured from the Parent Switch. As network engineers, we also have to know the FEX operation and the type of interfaces involve in this kind of topologies. Therefore, it’s important to identify the HIF (Host Interface), NIF (Network Interface), LIF (Logical Interface) and VIF (Virtual Interface). You can see an innovating technology ready for Data Centers, do you like to deploy a network infrastructure with Cisco Fabric Extender? It’s time to think. It’s time to have a plan.